Deciding to visit Voss was not best of my decisions. I could have tried Norway in a Nutshell full day trip instead of just visiting Voss, if only I could plan better. I should have taken the train till Myrdal and visit FLAM train. Flamsbana or the Flam Railway is pegged as one of the most beautiful railway tracks in the world. But due to my poor planning and because tourist information centre was closed on Sunday, I couldn't plan my day 2 in Bergen well. 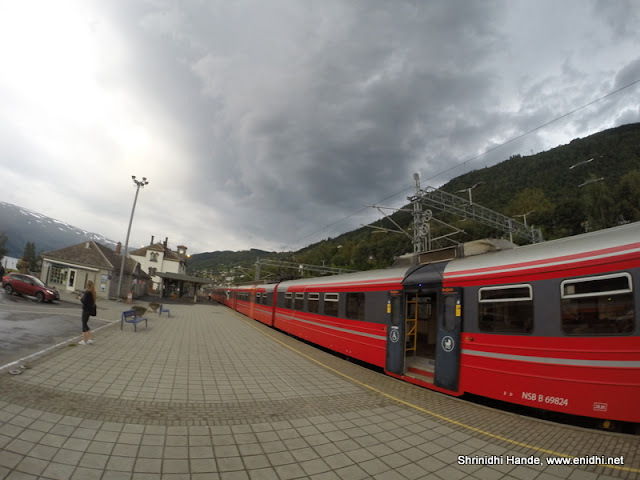 The train to Myrdal will stop for full 20 minutes in Voss, which is good enough to take a quick walk around town and come back to station. But due to my poor planning I took ticket only till Voss- with a plan of checking out Voss and returning to Bergen. Train Journey to Voss was through very scenic mountains and lakes around the mountains of Norway. I just had to keep my eyes open and look around. I had taken an early morning train that reached Voss at about 8 AM. The whole town of Voss was still asleep. There were not much to see in Voss. A church, a lake, few hotels and almost that's it. 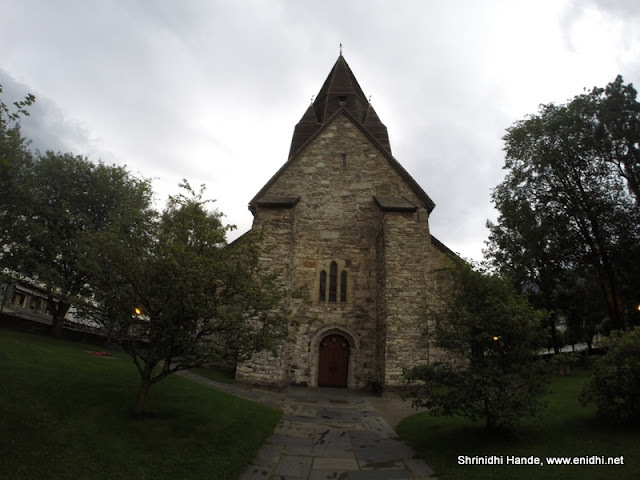 There was an information centre in Voss, but it was closed on Sundays. There was no free WiFi anywhere in Voss town, so I couldn't connect to net. 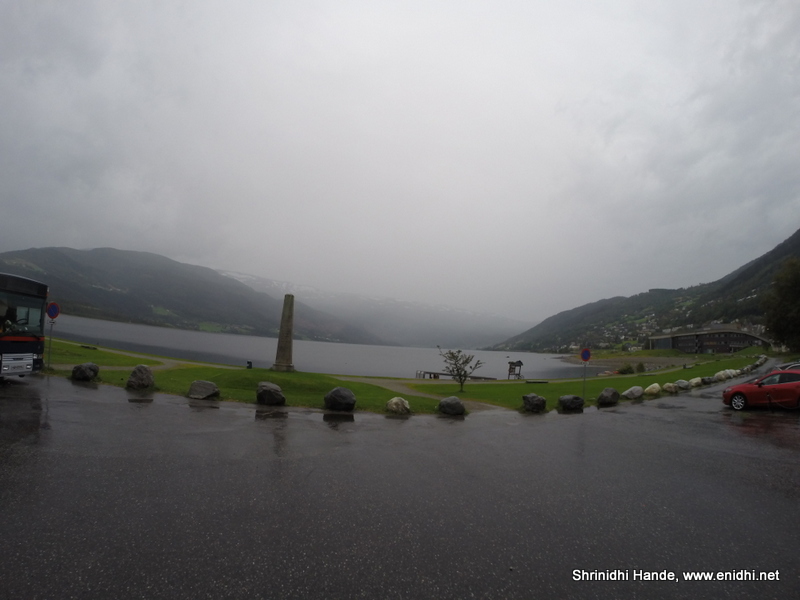 Also it started raining heavily when I was walking around Voss, so I had to take shelter and wait for an hour or so. Eventually I went back to train station and took train back to Bergen. I assessed if I can cover Flam train, but it was cutting very close (1 hour to Myrdal, another hour to Flam and back plus train waiting time carried a risk of me missing my return flight). So the Flam trip had to wait. 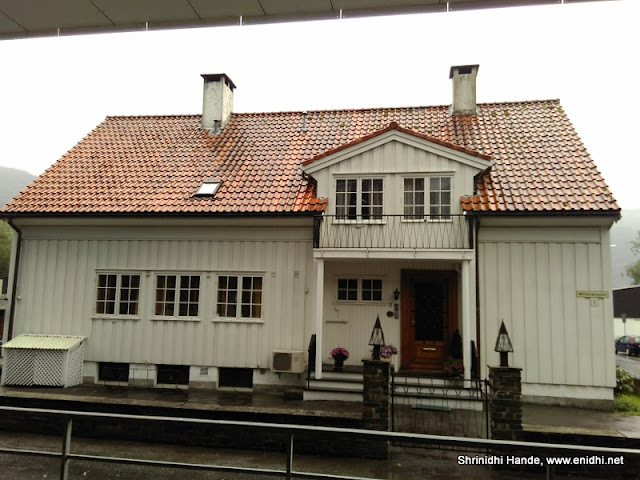 There are few branded hotels in Voss by the lake and close to railway station. If you fancy spending a night with mountain on one side and lake on other side, do book a room there. If pressed for time, I suggest explore Voss during the 20 minute stopover of your train. Unfortunate to have to wait in rain but the place looks nice. Good Post.. Well presented with beautiful Photographs!